This fascinating historical half-day trip from Boston takes you to the famous nearby Massachusetts cities of Cambridge, Lexington and Concord. Journey along the Battle Road Trail, follow the route Paul Revere took, and visit Harvard Yard and Cambridge Common, both US National Historic Landmarks. You’ll also stand on legendary Lexington Battle Green – the site of the infamous Battle of Lexington – and pass the homes of Nathaniel Hawthorne, Ralph Waldo Emerson and Louisa May Alcott. Your expert guide will teach you all about this area’s prominent role in the Revolutionary War and the Civil War while taking you to the cities’ most famous sights and off-the-beaten path locales. Pick up is offered from select Boston hotels (or meet us at the Transportation Building) in the morning for a quick drive over the Charles River to Cambridge, a city named in the honor of the University of Cambridge in England. This historic city is home to two of the world’s most prominent universities, Harvard University and the Massachusetts Institute of Technology. Drive by Harvard Yard, a large grassy area adjacent to Harvard Square that constitutes the oldest part and center the Harvard University campus. Your guide will explain how this locale became a US National Historic Landmark. Nearby, you’ll see Cambridge Common, listed on the US National Register of Historic Places. This is public park is where George Washington took control of the Continental Army. 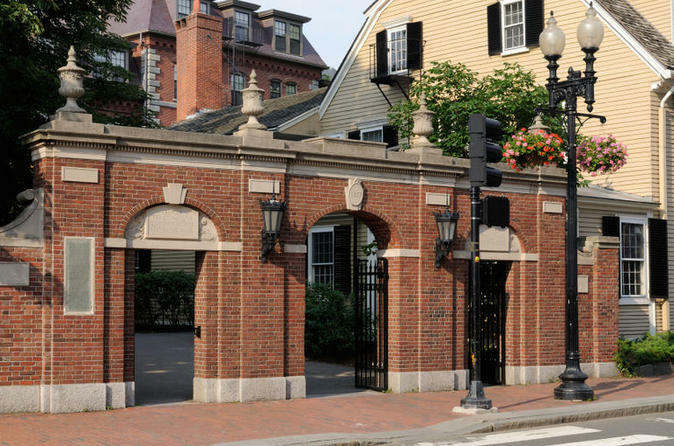 Next, drive along Tory Row past the home of the famous poet and educator, Henry Wadsworth Longfellow. Continue driving to the nearby town of Lexington, famous for being the site of the first shot of the Revolutionary War. You’ll see a variety of historical buildings, parks and monuments, most dating from colonial and Revolutionary times, on your drive through town. Hop off the coach at the Lexington Battle Green, formally known as the Lexington Common, for an up-close look at the site of the Battle of Lexington in 1642. Also a US National Historic Landmark, this field is fronted by a statue representing Captain John Parker, the leader of the Lexington minutemen. Hear about this man’s courageous efforts against 700 English soldiers as your guide conjures scenes from the Revolutionary War that happened on the very ground beneath your feet. In Concord, journey past the homes of Gothic novelist Nathaniel Hawthorne, Louisa May Alcott -- author of Little Women -- and Ralph Waldo Emerson, essayist, poet and philosopher. Finally, you'll make your way to the North Bridge, often called the Old North Bridge, where "the embattled farmers stood and fired the shot heard 'round the world.'" This is historical attraction was the site of the Battle of Concord; the current wooden pedestrian bridge is a replica of the one that stood on the day of the battle. After your historical tour, your guide will drive you back to the Transportation Building, leaving you with many new, fascinating insights on American history.